Join us in our commitment to turn childhood dreams into reality by supporting THONTM. 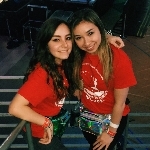 Together, Samantha Consoli & Molly Davis, are taking action by uniting with 16,500 student volunteers and over 25,000 alumni supporters in the fight against childhood cancer. Our year-long efforts culminate in a 46-hour, no-sitting, no-sleeping dance marathon each February to celebrate our survivors, remember those we’ve lost, and take a stand--all in hopes of one day dancing in celebration of a cure. Molly and Sam met through their THON 2018 Rules & Regulations committee. If you were to find them together during last THON weekend, they for sure would have been making themselves laugh about something or dancing around to keep entertained. If you run into them at THON 2019, it’s safe to say you’ll see them doing the same things. They cannot wait to bring their energy to THON this year and can’t do this without your help. Please consider donating or sharing our page to help aid us in the fight against childhood cancer. FTK, always! I have had the pleasure of being involved in THON for both of my years here at Penn State. The Rules & Regulations Committee became my home for two years, and I loved every minute of it. My freshman year, I remember walking into my first committee meeting and not knowing what to expect. Little did I know, those 37 strangers sitting around me would become my family. My first year on a committee was one I'm so thankful for, and so grateful to have experienced alongside such amazing people. Getting to dance around like an idiot at my first THON and see all of the happiness unfolding around me was a feeling I'll never forget. Thousands of people gathered together, all to support one amazing cause. During the final hours of THON, I stood and watched the Celebration of Life video play. All of the time and dedication suddenly made all too much sense when a familiar face appeared on the big screen of the BJC. My sophomore year, I was a member of a Rules & Regulations committee for the second time. I was chosen to serve as my committee's Education Liaison, which allowed me to educate my fellow committee members on important THON-related information each week. I loved being involved in THON again, and even more, I loved getting to teach my fellow volunteers about something I care about so dearly. My second THON was just as magical as the first, and it made me realize that I truly wanted to make a bigger impact. I remember swaying along with my committee members during the Final Four, looking up at the big screen, and thinking to myself that I was capable of doing more for those families. And this year, that is what I aim to do. THON.. wow what can I even say? I have had the privilege of being a part of THON since my freshman year here at Penn State. My first year, I participated in THON through the efforts of Penn State’s PreMed Society. I still remember what it was like to walk into the BJC and see THON for the very first time. It took my breath away and almost brought me to tears. I cannot even describe to you the feelings of love, positivity and the energy that radiated all around me. My first year I was merely a spectator, but after that I knew I wanted to do more and more for this amazing cause. My sophomore year I was a part of a Special Events committee, where we played a big role in the events leading up to THON, like the THON 5K and the 100 Days Til THON celebration. I was given the job of the committee’s administrative assistant by my captain, Kim, where it was my job to remind the committee of important news, events, etc. I loved being able to be a part of a committee, because it gave me the chance to meet some incredible people and get even more involved in THON’s year-round efforts. I remember going on the floor for the first time and being able to see the “behind the scenes” side of THON. It was SO cool and it was amazing to see all of the efforts of the other captains and committee members that THON goers do not get to see. It really made me appreciate all of the hard-work and dedication of my fellow THON volunteers. My junior year I was chosen to be a part of a Rules & Regulations committee and it was, by far, my favorite THON experience. I remember walking into our first meeting and talking to my new captain, Jackie, and a few of my committee members. Right from the start, the committee grew so close and we really were a family. I never knew a group of people could impact my life so greatly and so quickly. I was lucky enough to be appointed the position of Committee Mom, where it was my job to look after my “kids” (I even run into them on campus and they still refer to me as “Mom”). THON weekend, we grew even close, made so many memories and even shed a few tears together. I remember crying at Final Four during the Celebration of Life video with some of my committee members, and I can honestly say it was a moment I will never forget. My first 3 years here at Penn State have flown by and as a senior I want to do more for the children and families impacted by childhood cancer. Samantha Consoli & Molly Davis have been working tirelessly all year with the hopes of being selected to dance in THON 2019. Independent Dancer Couples are dedicated individuals who set up their own fundraisers throughout the year, and with the support of friends and family, will obtain tickets in a lottery system in the hopes of earning a spot as dancers in the Penn State Dance Marathon. 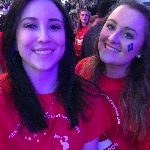 With your contribution, you will bring Samantha Consoli & Molly Davis one step closer to being able to take a stand against childhood cancer during THON Weekend 2019.